The buzz about XPS has unfortunately faded away during the last year, probably due to the discussions about the Open Xml formats. 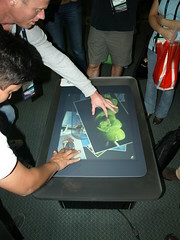 XPS is still here and will eventually submitted to ISO and proposed as a standard. Windows 7 has of course support for XPS. When you install Windows 7 (note build 6801) you get the Microsoft XPS Document Writer printer which is used to print anything into an XPS document. So you can create your XPS documents from any application with printer support. In combination with the updated Wordpad application in Windows 7 that supports both ODF and the Open Xml formats (post build 6801) you have a great interoperability experience. Now that you have created an XPS document you of course need to read them. On previous versions of Windows you needed to install a separate application, XPS Viewer EP, to get a good viewer experience but Windows 7 contains an XPS Viewer out of the box. The viewer is basically the same viewer that can be downloaded for previous Windows versions (it is in fact the same viewer and .exe file) but has a much more Windows Vista/7 like interface. It’s hard to say what the features will be like in the final version but this version has support for signing documents (only available if you opened an XPS using Internet Explorer on Vista) and managing your accounts. Can’t try it out fully since I have trouble creating my signing accounts. To sum it up; with Windows 7 you have a complete solution to read, create and sign your XPS documents. I have now done some initial testing and evaluation of the 6801 build of Windows 7, which we got at PDC 2008. First of all I was a bit disappointed that we did not get the updated UI that were shown during the keynote, instead we got a previous build that does not have that much changes in the UI. It boots pretty quick on my Virtual PC, yes I run it there – a little to early to switch out my main OS, and it has a nicer loading screen than Vista. First you notice that the notification area has got some changes; by default only the volume, network and Solution Center icons are present, you can configure it to show all icons by default if you want to. When you hover them you get a smaller and less graphical tooltip than on Vista and a small highlight of the icon. 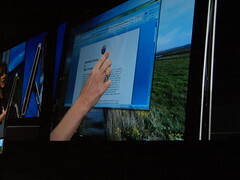 The area to the right of the clock shows the desktop if you click it, on later builds it will show your desktop with the current windows transparent (shown at the keynote). The Start Button glows a little more in this build than in Vista when hovered, but the version we saw at the PDC keynote looked a little bit more different. But, the interesting stuff is what happens when you right-click it! Now think how you normally starts Windows Explorer with the mouse – I bet that you do not go into the Start menu and select the Explorer program but instead you right click the Start button and selects Explore or Explore All Users and then you find yourself in Explorer and navigates back to the drive root from the Start Menu folder. No more in Windows 7! When you right click you just select Open Windows Explorer and voila – just as hitting Win-E! Nice! The Control Panel has changed a lot, it looks like they have worked most of the items over all in some nice and smooth transitional effects. The Resource Monitor have been updated heavily and are now a really interesting tool for monitoring your PC. You can easily select which processes or services to monitor. When checking out the processes you can filter out which to watch and inspect which modules and handles they have. Same filtering works for network and disc – you can see how much network or disc a specific process uses. When monitoring the network you can even see which ports and protocols a certain process uses and if the firewall blocks it or not. Good job, this will be useful! The Disk Defragmenter now includes an Analyze function so you can analyze your discs, and you can more easily see when you last defragmented your disks. And you can even see how your defragmentation is doing – couldn’t I do that in Windows XP? The scheduling also includes which disks to defragment during a scheduled defragmentation. The Fantastic 40, the set of application templates, for Windows SharePoint Services 3.0 has been updated with new language support. Among the new supported languages are Swedish, Danish, Portuguese and some more. Some of the DLL’s have also been updated (haven’t checked what). Back at the hotel and watching some Monday Night Football (which I could do that in Sweden!). Here is a summary and some reflections on my day. Woke up early and walked down to LA Convention Center and got me some breakfast (tomorrow I’ll eat at the hotel). I tried to get to the keynote hall as early as possible for some good seating. I ended up in 6th row and had a good overview of the stage and the huge screens. As this is my first PDC and first conference of this magnitude I’m really impressed with the size and organization of it all. 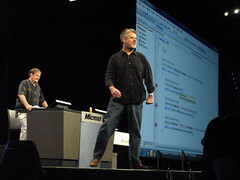 Ray Ozzie, Microsoft Chief Architect, hit the stage and did after an introduction introduce Windows Azure – Microsoft’s new cloud server and offering. Windows Azure and the Windows Azure Platform is Microsoft’s way of hosting your services in the cloud. Microsoft will also have a set of services ready; such as Exchange Online, SharePoint Online, Dynamics CRM Online etc. 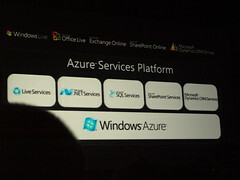 Windows Azure pricing will be based on subscriptions and SLA’s and competitive. I think the Windows Azure Platform can be really interesting. The thing that really made me interested was that you can federate your Active Directory (and/or your customers) and use that as authentication on your services in the cloud. I really like what Patrik Löwendahl calls it (article in Swedish): “Outsourcing 2.0”. 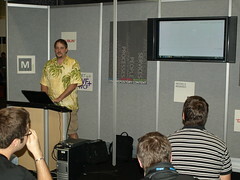 Then I headed over the the Big Room and got stuck when Chris Anderson made a spontaneous demo of the new M-language. It looked really cool when he on-the-fly showed the small crowd how to create a schema from a text and then validate your input and create structured data. Got a book with the draft specification of the language and I will browse it through until tomorrow when Chris and Don Box will have their keynote. After this I tried on some Hands-On Labs with the Windows Azure federated authentication – sweet! 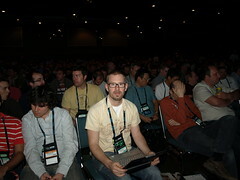 I had hard then deciding which session to attend and I finally selected ASP.NET MVC. Really good session with really good presenters. I like lean and neat HTML code and the MVC model. I hope to get to do some nice projects with this in the future. Unfortunately I’m very bound to SharePoint now so that will likely not happen so soon, if not SharePoint “14” will use this…say no more!?! Then it was freebie time with food and beer in the sponsor area. I now have a set of t-shirts to wear when painting the house. Some interesting sponsors and some interesting give-aways. Did have some time to play with Surface a little more, if I win on lottery I'll order one right away! 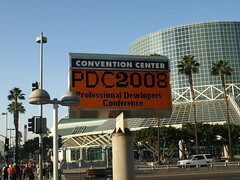 I have arrived at my first PDC and it’s an awesome experience. The conference is huge and I arrived here for the registration and breakfast and met up with some nice guys. I fetched my bags of goods which contained mostly magazines and a bunch of sponsor commercials. We’ll have to wait until Tuesday until the real bits (the hard-drive stuffed with goods) are released and revealed. The keynote on Tuesday morning will really be interesting. As Pre-Con session I choose the Performance by Design, an area which I keep close. Nothing revolutionary was really revealed during this session, which took the whole day and a little more. I really like this enthusiasm that the presenters (Rico Mariano, Vance Morrison and Mark Friedman) had, they really made this, on the paper, boring session great. The mantra from the day was Measure, Measure, Measure. Most of the stuff I was aware of, except for some nice tools that now is slipping out of Redmond. But even if you are aware of all this you need to practice it, which they gave some nice examples of; what, when and how to measure. Image verification will will be optional – no longer need to GAC every assembly? The day ended up with a nice SharePint at the Biltmore hotel, where I met some really nice SharePoint MVPs and developers. I had some fun when using Microsoft Surface when getting the directions to the hotel. Sitting here in Zürich waiting for the delayed flight to Los Angeles and PDC 2008. And of course be one of the first to try out all this new stuff! I will be staying at the Westin Bonaventure hotel and drop me a line if you would like to meet and have a pint or two. First of all we need to make an assembly to host our code behind. Start Visual Studio and create a Class Library project. Add a reference to Microsoft.SharePoint.dll and System.Web. The Microsoft.SharePoint.dll can be found under c:\Program Files\Common Files\Microsoft Shared\Web Server Extensions\12\ISAPI (who came up with the idea to place this stuff here by default?). Create a class called HelloWorldPage and make it inherit from Microsoft.SharePoint.WebPartPages.WebPartPage. Now add an asp:Label control to your class and then write the code for the Page_Load, just as in the previous post. Before finalizing this assembly we need to sign it – SharePoint does not really like unsigned code, and it also allows you to install it into the GAC. Now the fun begins. Change the @Page directive attribute Inherits to your own class and assembly. It should look something like above. First you have the full name to your class, then you have the assembly strong name. You can find the strong name by looking at your DLL using Red Gate’s Reflector. Copy your DLL to the SharePoint site bin directory and load your application page in the browser. You can also register your assembly in the GAC, but using the bin directory method is easier when developing. Description: An error occurred during the parsing of a resource required to service this request. Please review the following specific parse error details and modify your source file appropriately. Parser Error Message: The base type 'HelloWorld2.HelloWorld2Page' is not allowed for this page. The type is not registered as safe. From here I hope you can continue on your own and make some really neat stuff with SharePoint. Recent discussions in the SharePoint forums led me to write this article on how to create the simplest form of SharePoint applications without using Visual Studio and only SharePoint Designer. Just follow these simple steps to create your own Hello World application in a .aspx hosted in a SharePoint document library. First of all we need somewhere to host our applications; create a new Document Library, I called it Applications, and set the default template to either Basic Page or Web Part Page. This sample uses the Basic Page as template. Now we need a .aspx page to host our small Hello World. Create it by creating a new Basic Page in the document library you just created. Now fire up SharePoint Designer and open up your site. In the folder list you will find your document library (Applications) and your application page (HelloWorld.aspx). Now open up HelloWorld.aspx and view the source. Remove the WebPartZone in the ContentPlaceHolder called PlaceHolderMain, so it looks like this. Create a standard asp:Label control in the table cell. I placed this code inside the PlaceHolderMain place holder. Save the file and view it in the browser. Reload your browser and you will see your Hello World text. This was the simplest form of application page for SharePoint and you can of course make it even more advanced. If you want your code placed in a code behind file, just inherit from the Microsoft.SharePoint.WebPartPages.WebPartPage class and create your own code behind. Warning: Due to criticism on me posting this sample I have to provide a warning. The intention of this post is only to show that you can use code blocks in your SharePoint application and not to show you that it is the best way. By enabling code blocks in a library you open up for "evil" code to be uploaded to your SharePoint site and you might jeopardize security and stability of your SharePoint installation. For a more secure and reliable scenario look at this follow up post. Emma Healy of Emma Explains Microsoft Licensing in Detail has written a post on how to calculate what Microsoft Office SharePoint Server 2007 license you should use for your public facing/extranet MOSS site. The post has a flow chart to aid you in your decision to choose a MOSS for Internet Sites license (expensive!) or CALS (less expensive). To sum it up you should use the MOSS FIS if you have more than 435 users when using MOSS Standard or more than 242 users when using MOSS Enterprise. Note; if you are making a web site with MOSS for an unknown amount of (anonymous) users, your only way is to go for the MOSS FIS license. I only whish that there was some license in between for small businesses or a version of MOSS with only the publishing features. When using Lists with Content Types enabled and you have your custom columns there are some things to remember, such as the custom columns are not part of the list content type items until you configure it so. For example; when you add a custom column to your list you have to option to add your column to all content types. As you can see from the image above to the right, the Test column is present in two content types and Test2 in none. If you at a later stage decide to add a new content type, your custom columns will not be added to the content type. You have to manually configure the content type of the list, not the site content type definition, and add the column. Modify the list content type from the list settings and choose Add from existing site or list columns. Everyone, every company, small or large has some kind of file server for storage of documents and other files. The file server are in many cases the heart of the operations. Some have several file servers and some have even more. Almost every file server looks the same; some kind of shared folder with subfolders (in absurdum). Most of these file servers uses file/directory permissions to have control over who are allowed to view or edit the files. Most often this is configured through groups, but far to often permissions are set on user accounts directly. I will try to show you how you can solve most of these problems and move in to a whole new world and experience in document/file management. First we start with how you can help your users find the files easier. Information Workers spend about 20-30% of their time searching for documents or recreating missing information. Wow, that’s an awful amount of time. What if I could find my documents easier! Improving the search possibilities for your file servers is by far the easiest and fastest way to improve your current file servers. By allowing your users to search for files, you will save them (and your company) time, you will make them happier and you will get one step closer to a more efficient document/file management system. Microsoft Search Server 2008 Express, MSSX, is a great piece of software that will allow you to index you file servers in just a few hours, without any cost! All you need to do is to download it, install it and configure it to crawl your file servers. MSSX is based on Microsoft Windows SharePoint Services 3.0 and is free of charge (but limited to one index server). It has a simple user interface and an incredible search engine (same as in Microsoft Office SharePoint Server 2007). As soon as you have had it to crawl your files you can create a link from or frame it in your current Intranet or portal and show your co-workers how to use it. They will immediately be able to search for the files they need (with ranking and everything) and you will be the Hero of the day. When I have suggested this solution to our clients the first question I have received is – we have tried it and it didn’t work for us since they could find all documents, including the ones they do not have permissions on. This is not true with Microsoft Search Server 2008. Companies who tried this most often used an application built on the Microsoft Index Server which did not have a security control in the search results – but MSS(X) has, so they will only see documents they are allowed to see. Once you’re setup you should install filters for PDF files and others so all of your files gets crawled by content. All this just takes a couple of hours and does not require and advanced skills and have a huge impact on your file management experience. Search Server 2008 has, of course, numerous of optimization options for which you should consult your consultant. Trimming MSSX allows you to even more enhance the search results and gives you the opportunity to help your users find the correct information. But beware, trimming it the wrong way can severely impact the results in a negative way. If you do this, you have a really good search application which uses your current file structure and your users does not have to change their behavior and you have not made any changes to your infrastructure. But that’s what I’m going to talk about next time – really trying to help you say goodbye to your file servers. I noticed some interesting stuff on some “leaked” screenshots from Windows 7 (M3) – there are some changes going on in the lower right corner. I can see a couple of changes that draws my attention. The icon you can click on to show the hidden icons in the notification area has changed. Is it more than this? By the looks of the icon my guess is that it is more than just showing the hidden ones. The thing that looks most interesting is the space to the right of the Notification Area, to the right of the clock. What is this? Anybody? Does it belong to the Notification Area or is it something new to the Taskbar in general? What really looks annoying is the spacing between the icons! Already today I think there is a waste of space down there between the system icons and the application icons. Now it seems like there will be even more spacing between all of the icons. Hey Windows 7 team, pull your strings together and tighten the icons a bit or at least make it customizable. The Engineering Windows 7 blog recently posted an article about the user interface and Taskbar in particular. Not much is said about the Notification Area except that they are trying to make it “less noisy and something more controllable by the end-user”. PDC 08 is only a few weeks away and I think I will get my answers then. See ya’ll in Los Angeles.